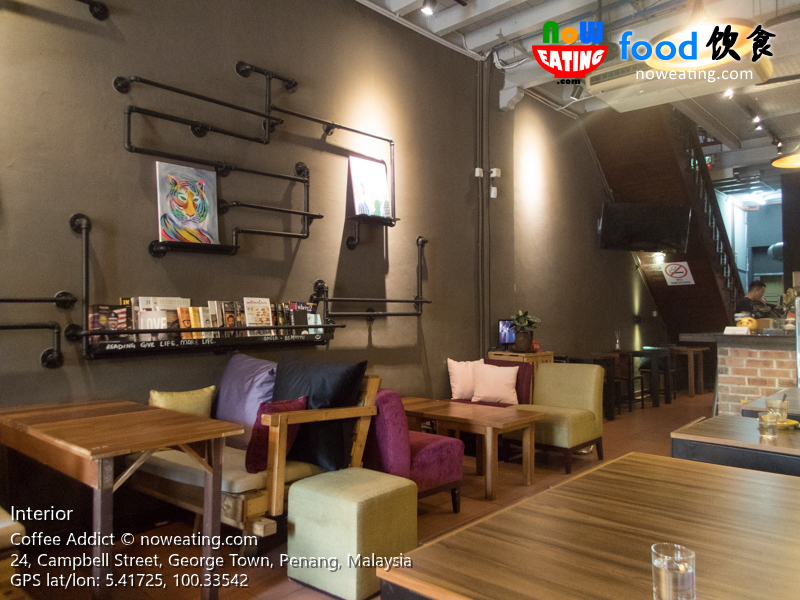 It was one Saturday afternoon when we visited this new outlet with friends. Parking-wise, you may try your luck along Campbell Street. Alternatively, there is a parking lot behind the cafe, next to Tek Sen Restaurant at Carnarvon Street. Previously, Coffee Addict was as good as an after-meal place for chillax, such as by having a cup of coffee with a slice of cake. 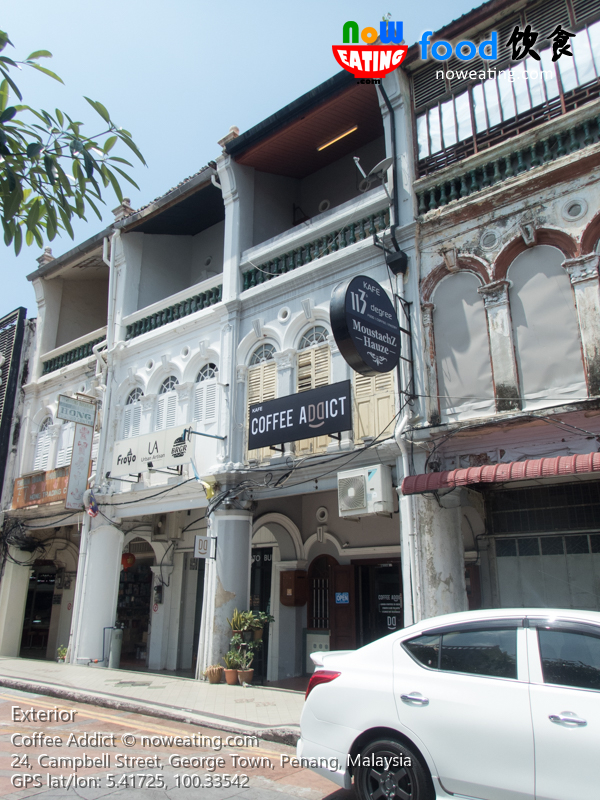 Other than the ordinary Cappuccino (RM11), the cafe ran by a group of young entrepreneurs offers signature coffees as well, including Cafe Bon Bon (RM9) we tried at its new premise. 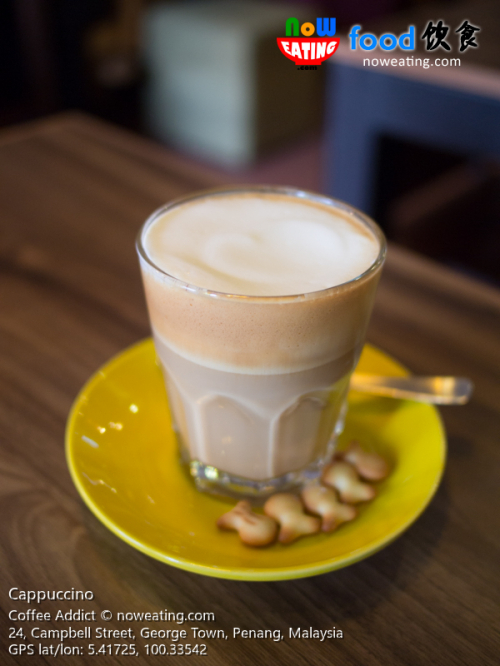 As quoted from its Facebook page – Bon Bon is one of the most popular coffees in Spain that layers espresso over dulce de leche, also known as sweetened condensed milk. The Cafe Bon Bon is one of our very first popular coffees… Our verdict: Blend of espresso with local coffee. Two thumbs up! 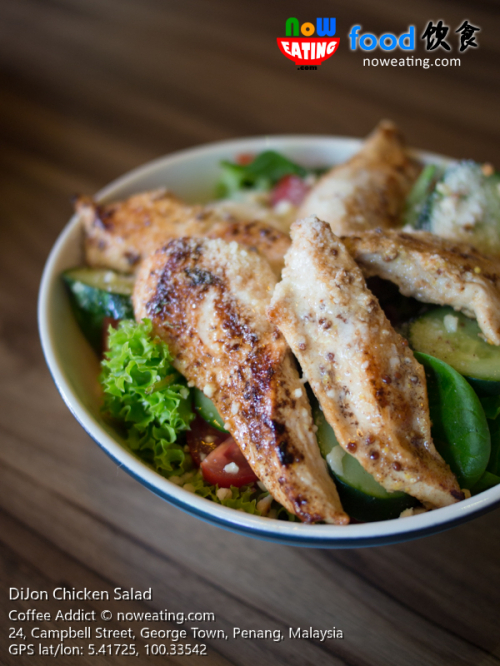 With generous amount of chicken breast fillet, DiJon Chicken Salad (RM20) is more like chicken topped with salad instead of another way around. 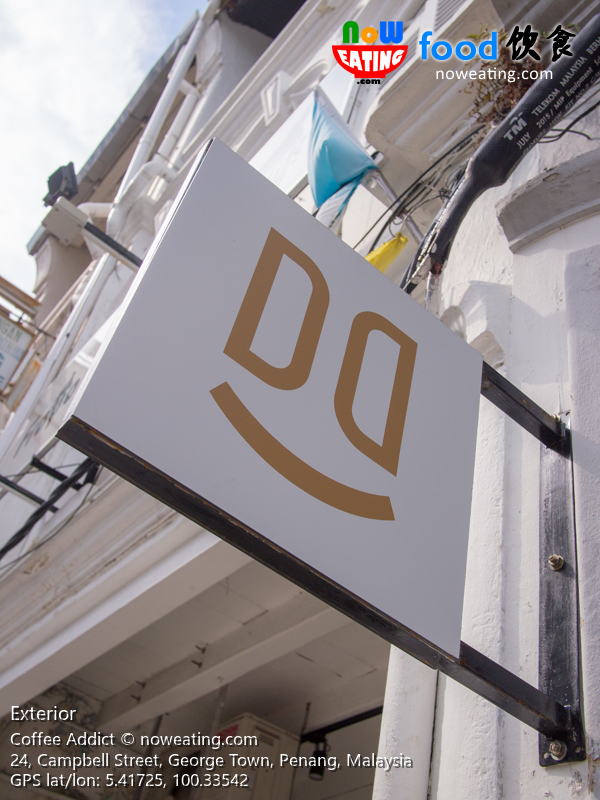 Open as early as 8am, Coffee Addict can be a peerless breakfast spot in George Town area. 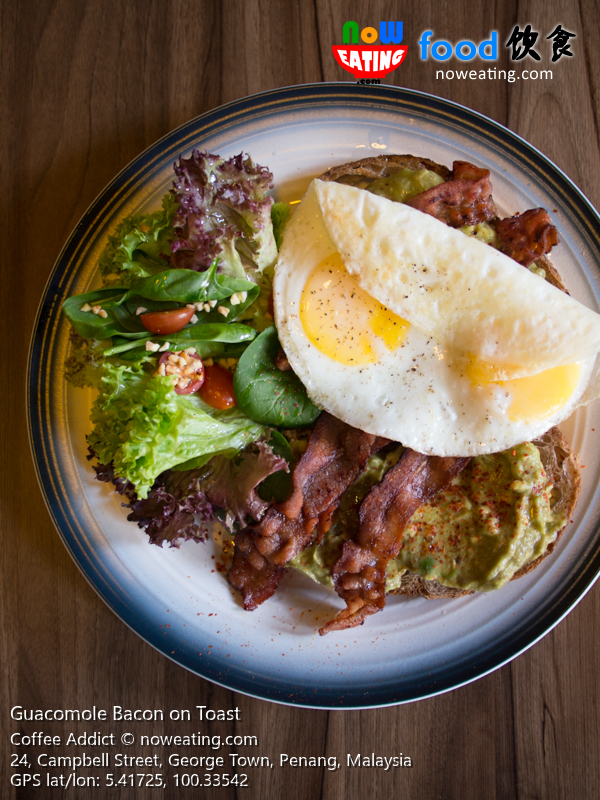 The savory Guacomole Bacon on Toast (RM18) is unquestionably a great alternative to “Big Breakfast” with toasts topped with avocado puree, bacon, sunny-side up eggs, and salads. 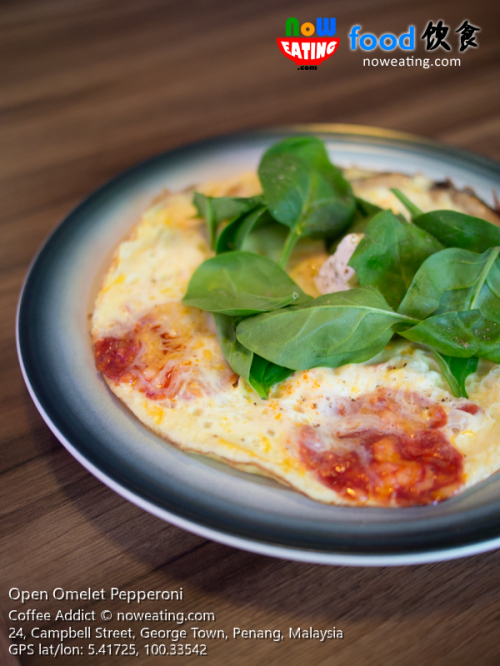 The aroma of eggs pervaded our dining table the moment Open Omelet Pepperoni (RM18) arrived and this dish is best consumed hot. Not in the mood of having Western cuisine? 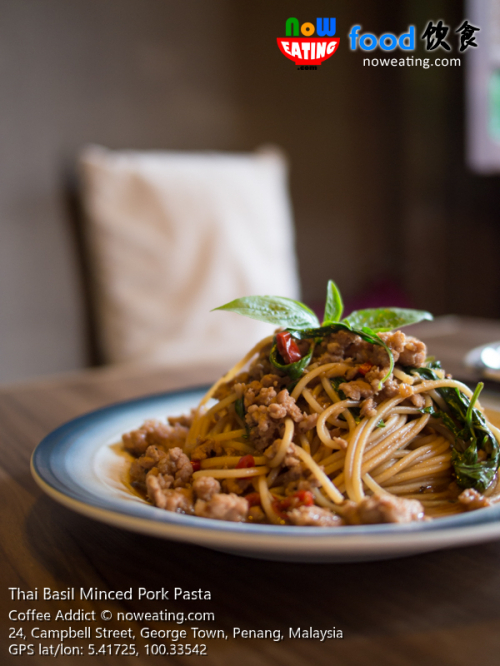 Try Thai Basil Minced Pork Pasta (RM20) which will definitely tantalized your taste buds. 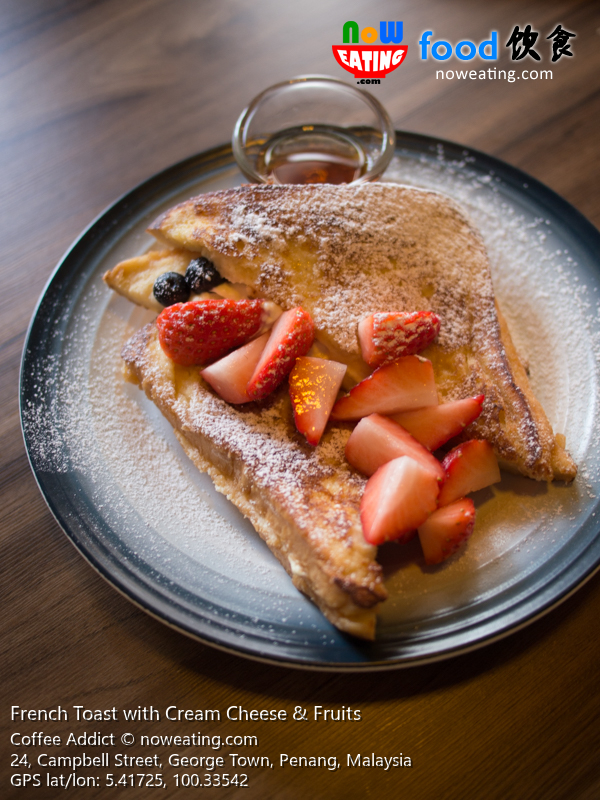 We were surprised the winner of the day went to a dessert – French Toast with Cream Cheese & Fruits (RM15) with aromatic and silky smooth toast. Maybe we had tried too many subpar French Toast out there. Coffee Addict’s one finally rises our bar again. Having a long day? 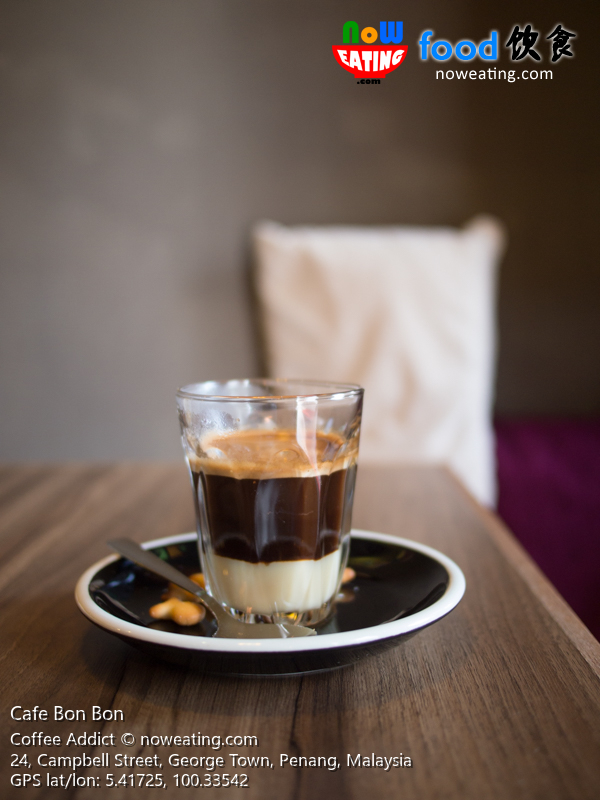 Saint John Espresso inspired by Coffee Romano will definitely send you to cloud nine. 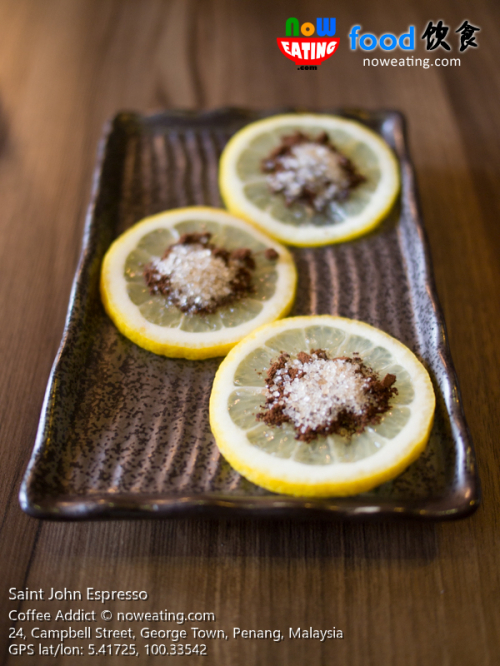 The new chef’s creation was yet available in menu during our visit but feel free to ask the staff for the availability. Our verdict: If you like acidic stuff or adventurous, go for it! As a whole, we were utterly satisfied with food at Coffee Addict. Are we going to return to Coffee Addict again? Definitely YES! 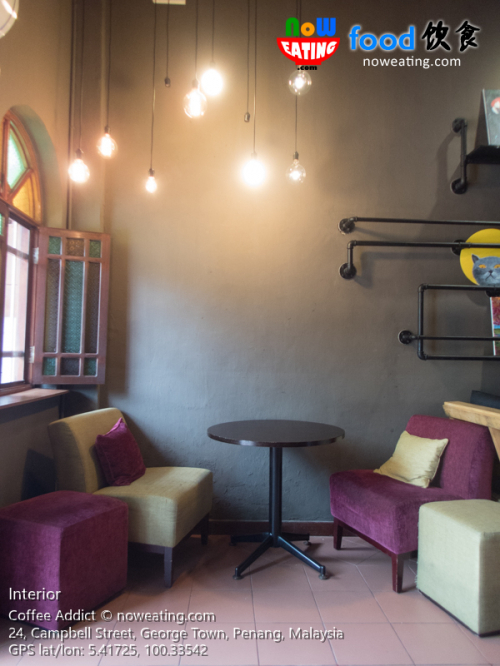 Coffee Addict is opened daily from 8am to 6pm and is closed on Tuesday. 8am-6pm daily. Closed on Tuesday.